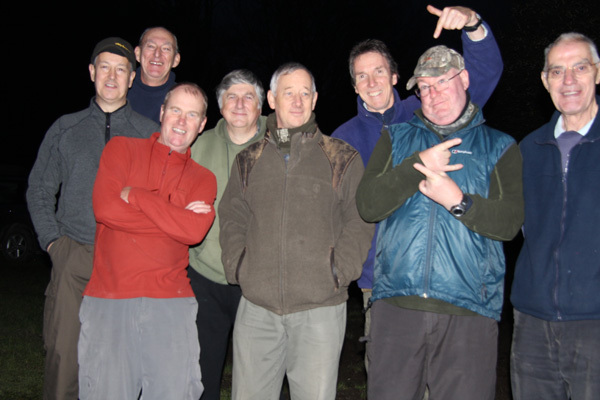 Last year the 7 of us had to call off our river Itchen river adventure due to the floods. Now normally we book for November however last year it was booked for February. Not wanting to make a mistake again and be caught out this year we reverted back to November. So the list of participant’s is Sir Geoff, Steve, Colin, Chris, John, Tony and Alan. Plus me of course as I do all the organising. So we had two days fishing to look forward too. 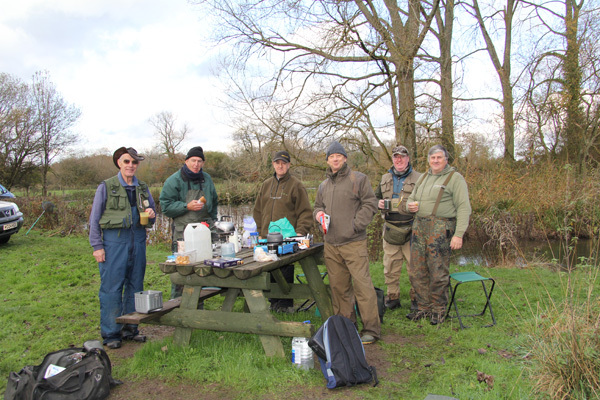 We met at first light on a stretch of the river Itchen I had 4 of the Bristol mob and Colin had 3 of the Bedfordshire lot. John was going to arrive later as on the Tuesday he had flown to Scotland to see England beat them 3-1. The river looked to be up from my previous visit but was still very clear. Clear enough to see the grayling taking the bait in the shallower swims. Whilst the other got started I help Sir Geoff get the tackle sorted. He is normally a trout and sea fisherman and hasn’t trotted before. So I took my time explaining the method and equipment. Plus more importantly how to feed the maggots in to get the fish feeding. We started off in a deepish bend where the flow was not as fast as some of the other swims. We went through the casting and trotting process which he grasped quickly. He was soon catching some great trout and grayling. The only problem with his catching fish was that he thought he could just lift into the fish just like trout fishing. However after saying that he was striking like a “girl” he soon mastered the art very well. 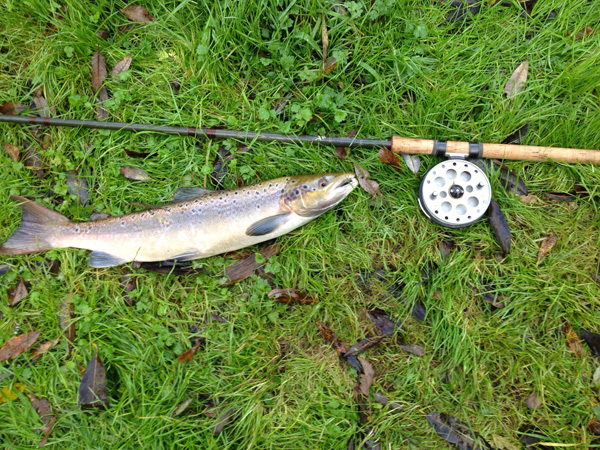 So after his trotting improved we moved to another swim which had some huge trout and a few grayling feeding. 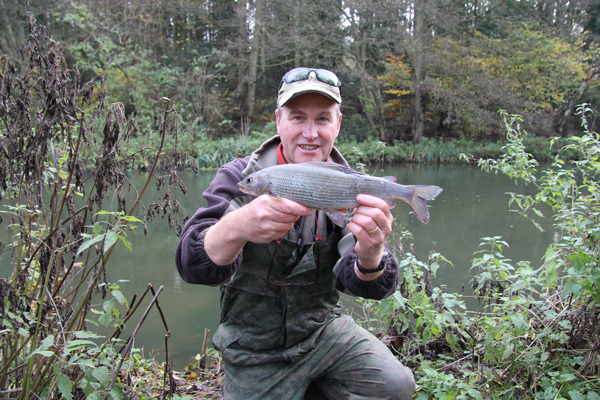 It wasn’t long before he had a good few trout and grayling to 1lb 4oz, which is a good size for a beginner. 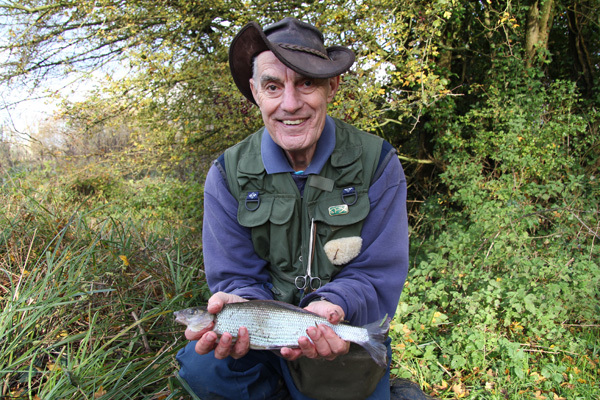 We could see a much larger grayling in the swim but Sir Geoff was unable to tempt it. We moved on to other swims and the morning passed with Sir Geoff taking some good fish from a swim further down the beat. Soon though in double quick time lunch hour arrived. We agreed to meet at 12.00 for a lunch with tea and coffee and Alan with his bovril . I think everyone was catching some good fish. We shared stories and photo’s. Alan had hooked a nice chub of 4lbs 12oz on cheese paste. Chris, Tony and Colin were doing well. Steve had a photo of a rather large skinny brown trout that would have weighed well over 5lbs if it were in good condition. So we all rested watered and fed. I let Sir Geoff loose on his own now and I tackled up ready for the afternoon. I had a message from John to say he was delayed and he would be there for 2pm. So I had just enough time to fish for 1 hr in a couple of swims. Lady luck was on my side as I managed to catch a 1lb 6oz grayling a small chub of about 3lbs plus a few other trout and grayling. Sure enough John turned up and I suggested he use my rod for the afternoon. 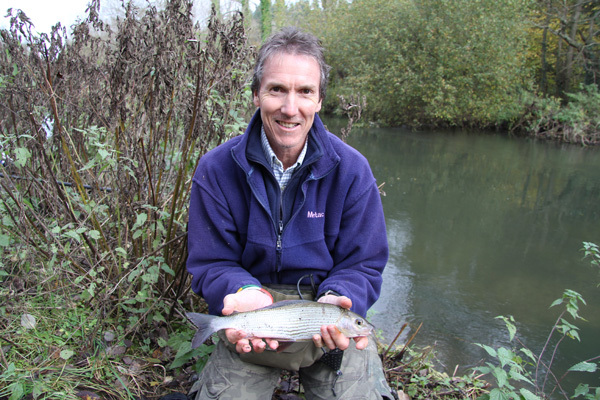 Now John has trotted before on the Itchen and soon he was catching some big trout and grayling. It was none stop action for a long time. We only fished a short section of river and in every swim he managed to land some good grayling to 1lb 4oz. He only had about 2 hours of fishing but it proved to be exciting enough for him. The others were also catching some great fish and Steve had the largest of the day of 1lbs 11oz. 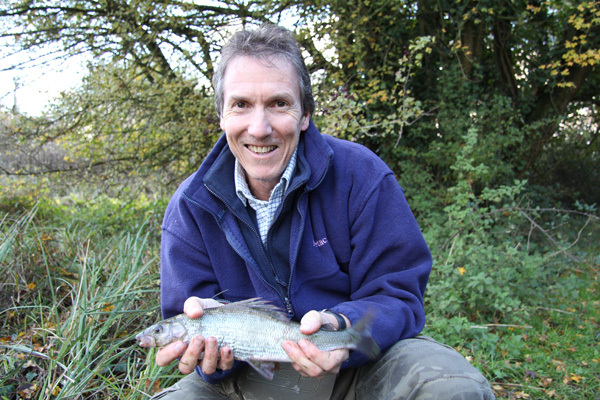 It was caught where Sir Geoff had been fishing and I think it could be the larger grayling we saw. Well done Steve. The only problem with fishing in November is that the nights really close in early. With the overcast day it was 4.20pm when it became difficult to spot the float going down the swim. So we met back at the cars ready for the short journey to the hotel. Once checked in we agreed to meet in the bar at about 7pm. I had previously booked a table for 8 so everything was sorted. We had an excellent dinner and banter between us all. All too soon it was time for bed as most of us had been up since 4.30am. So we met at 7am and made our way to the fishery. I was cooking breakfast for everyone, bacon butties washed down with tea or coffee. Again after sorting out Sir Geoff and John with tackle etc and clearing away breakfast equipment it was 8.4am before I cast out. Today I was going to using sweetcorn as bait. The grayling had seen lots of maggot over the last few weeks so I thought a change might be good. Sure enough I found some excellent fish in several swims and had plenty over the 1lb mark with the largest going 1lbs 6oz. I even had time to shoot a short video on the GOPRO camera for the first time. Alan and Colin were fishing just below me and continued to land some lovely fish. 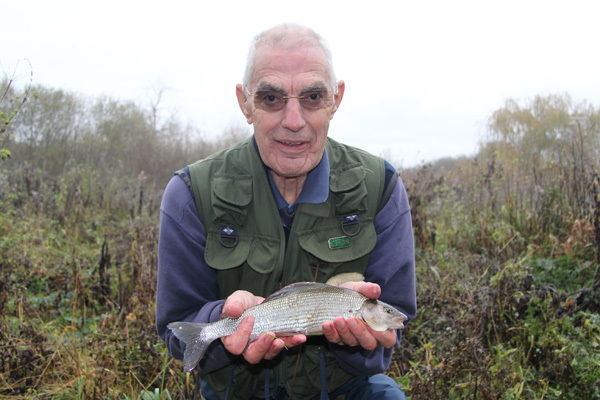 Colin had another grayling of 1lbs 11oz which was a pb for him. Didn’t quite get a photo of this one. Again Sir Geoff was having an excellent morning catching trout and some good grayling to over a pound. Tony was having trouble with trout but getting his string pulled plenty of times. Soon it was time for lunch and we gathered to tell the stories. I think while we were gathering Steve was fishing and hooked a salmon. Chris and I were close by and he cried help. So I grabbed the net and with Steve’s reel screaming it was obvious that the salmon was controlling Steve rather than the other way round. Steve did a great job in not losing it as it jumped a good few times. We saw it in the river a very red salmon dashing around. I thought we had it beaten as it was in slacker water however the last leap ended the fight. The day continued to pass very quickly with plenty of grayling and chub plus the odd chub putting in an appearance. I found plenty of grayling taking the corn but no large ones. We are not sure how many we caught, however plenty enough to have lost count. One thing we did mention was that although it was possibly fewer in number than previous years the average size was increasing. We met at last night to present the awards. The largest grayling was equalled by both Colin and Steve. 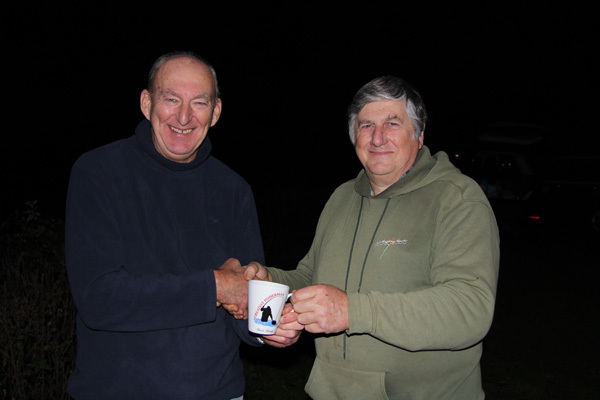 However Steve kindly let Colin have the cup as it was a pb for him. The Omnishambles award went to Steve, he left his two days supply of food in the fridge at home. Or at least I think that’s what the text from his wife said. Alan won the other award for the best other specimen with his 4lbs 12oz chub unfortunately John had forgotten to bring it with him. So he will need to wait until our next outing. So a great 2 days in super company, plenty of banter and laughs. All I need to do now is sort out the next one. This entry was posted on Sunday, November 23rd, 2014 at 5:57 pm	and is filed under Uncategorized. You can follow any responses to this entry through the RSS 2.0 feed. Both comments and pings are currently closed.